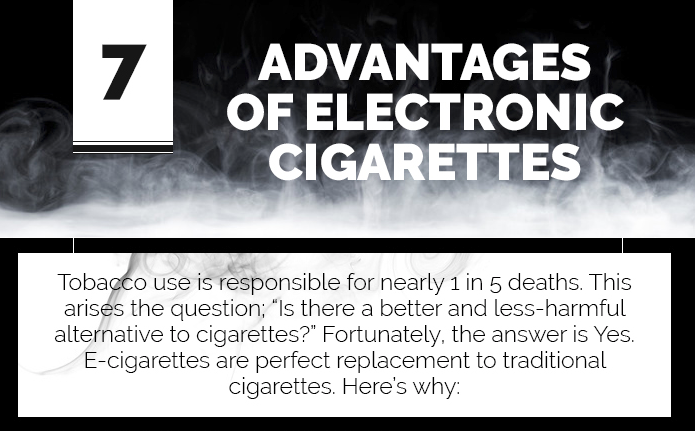 Home » Blog » Infographic: 7 Advantages Of Electronic Cigarettes! Tobacco use is responsible for every 1 in 5 deaths. Smoking is the most prevalent addiction worldwide. According to one research, one billion people smoke tobacco cigarettes worldwide. But is there a better and less-harmful alternative to cigarettes? Fortunately, the answer to this question is Yes. E-cigarettes or vape pens are the perfect replacement to traditional tobacco cigarettes. Here are some of the advantages of e-cigarettes. They can be vaped anywhere. There are very less or no restrictions on the use of e-cigarettes. With traditional cigarettes, the sense of smell decreases over time, but vaping can improve it. E-liquid comes in a variety of flavours, including vanilla, strawberry, cherry and more. You can easily adjust your nicotine level with a vaping device. You can start with high nicotine and gradually decrease the level of nicotine if you want to break the habit of smoking. Not to mention, vaping is far less expensive than smoking traditional cigarettes. Please include attribution to vaperchoice.com.au with this graphic.